The Truth about Ticks - Yes Pest Pros, Inc. The Truth about Ticks - Yes Pest Pros, Inc.
Every US state has ticks, and every US state has ticks bearing disease. This is an unpleasant fact about ticks. The blood-sucking arachnid poses a threat to your family, and it could be living in your yard right now. Regular pest control services can help limit your exposure to this tiny biter and reduce the chance of contracting a tick-borne illness. Here are some of the facts you should know about ticks. Ticks can survive the winter, even where it gets cold. Many people think ticks will not survive a freeze or a snowstorm but this not true. In many cases, ticks just gravitate to warm structures like your home to wait out the cold. Some tick species can produce a type of biological “anti-freeze” to survive. Ticks maybe most active from April to September but they are still a year-round pest control issue. Lyme Disease is not the only illness ticks can carry. While Lyme Disease is perhaps the best known tick-borne illness, there are others. Rocky Mountain Spotted Fever is another illness that can be traced back to ticks as well as “dog fever” or anaplasmosis and ehrlichiosis and potentially more. Ticks cannot be removed or forced to release their prey with lit matches, nail polish or petroleum jelly. These methods simply do not work. A tick will not let go for any of these reasons. They might even cause the tick to release more disease-infested saliva into the wound. The only way to remove a tick before it has finished its meal is to grasp it firmly with forceps or tweezers as close to the skin as possible and pull it steadily out. Wear protective gloves and dispose of the tick in rubbing alcohol or just flush it. Ticks do not live solely in trees. Just because you don’t live in the woods doesn’t mean you won’t encounter ticks. They live on the ground equally well as they would in a tree. They crawl up their host, which is why they are so often found on the neck or hairline. It is not because they “dropped” there. Pets can contract multiple diseases from a single tick bite. 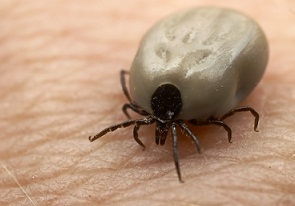 Ticks are not typically hatched carrying disease. They acquire them by feeding on infected hosts. They then pass the infection to the next host via their saliva. Your pet is particularly at risk of contracting tick-borne diseases as a single bit can transmit multiple pathogens. Dogs are more prone to tick bites that cats but any warm-blooded mammal is at risk. Ask your exterminator how you can best keep your family and pets safe from ticks and the diseases they bear.